"Art is life. It isn’t a single thing. There are no guarantees. It challenges and rewards. We get what we choose from it." The above probably reads like a grandiose statement about art or that it might have given art too much power to be an analogy to life in general, I would like to dissect Jim Hodges' statement above (in fact, initially extracted from an essay written for Aspen Art Museum) into two parts to explain why I quite liked his exhibition that is currently occupying two Gladstone gallery spaces until December 23. For those that have read a few of my postings, it should come as no surprise that I would call myself a sentimentalist at times both in life as well as in my choices of art. I would say that art is life only in the sense that it isn't a single thing, it is many things and could be perceived differently through different minds and eyes. 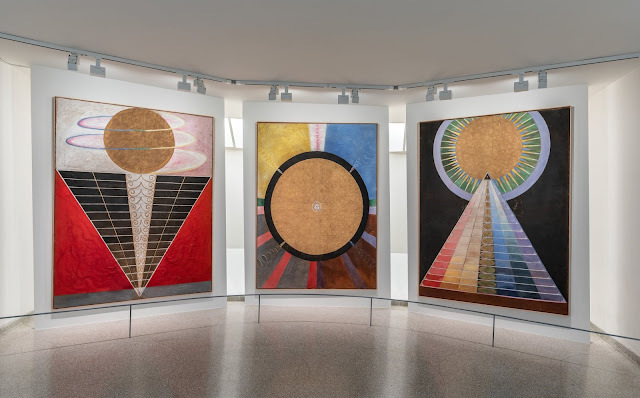 As a sentimentalist, often times I tend to enjoy works that speak to me on a visceral level more rather than works that present an immediate challenge to my intellect and knowledge of art history. To further justify, though my nature might have been a sentimental one however, my environment and life experience also have taught me to dive deeper intellectually and to ignore the emotional pantomime within under appropriate circumstances. From looking at Hodges' recent works, I dare say that Jim Hodges is also somewhat of a sentimentalist. What his work presents to the spectators is this beautiful experience of sensory engagement through light and reflection. 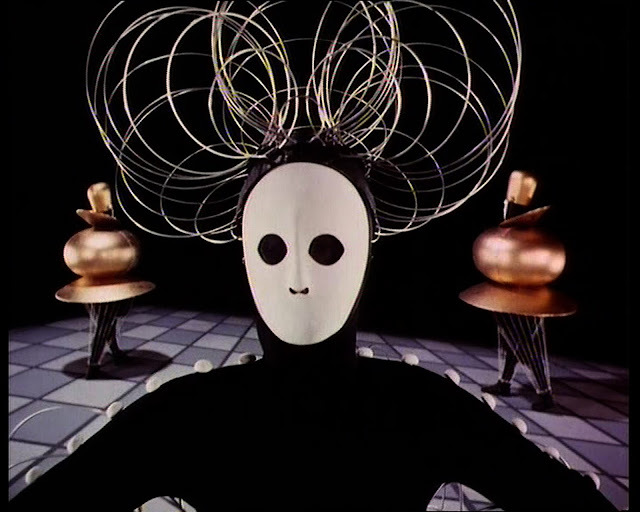 In order to visually and viscerally experience what Hodges has embedded in this piece is to be physically there while the disco globe turns in the center. For the time being, let's settle for these video clips of globe and reflection of the water rippling below. The most striking thing about the piece isn't its construction, although digging a hole in the gallery floor then filling it with water alone is quite elaborate and noteworthy. 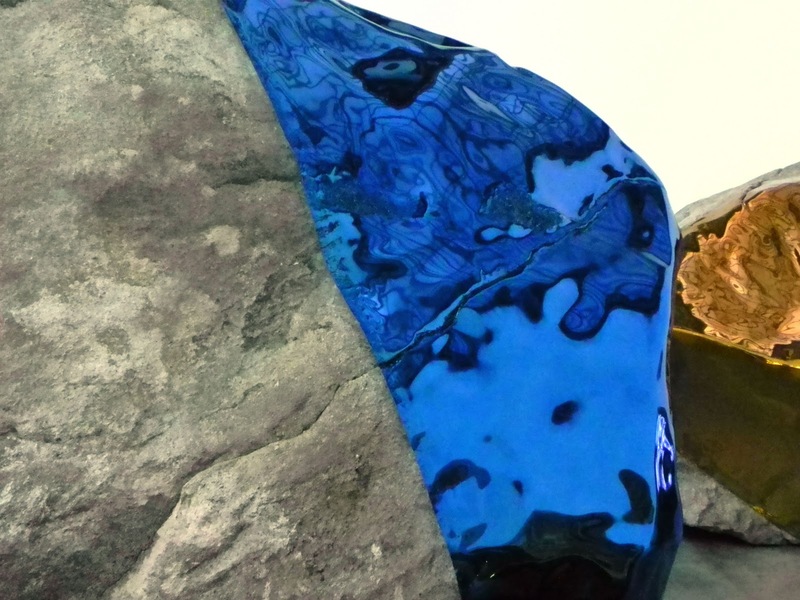 However, the most striking element of the piece is its reflections. It isn't the object itself but what it gives off in collaboration with the emission of light. 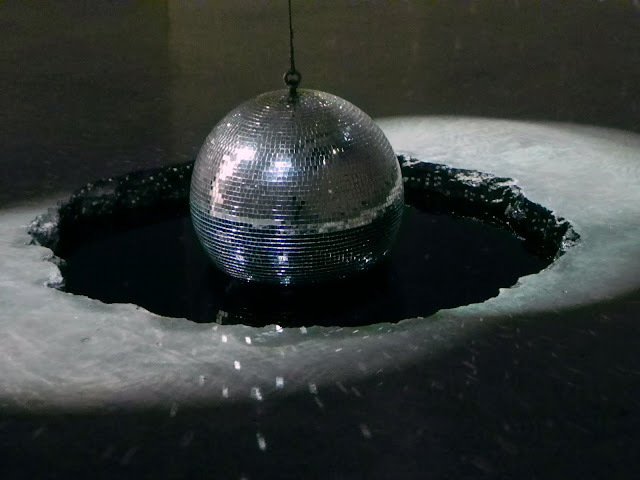 This piece has an interesting combination of nature, such as water, the natural material of the floor revealed by the making of the hole with the superfluously glittering disco ball and spot lighting of the gallery. The result is utterly mesmerizing because on one hand it reminds one of a starry night but on the other it reminds one of a chemically induced experience at a dance club. 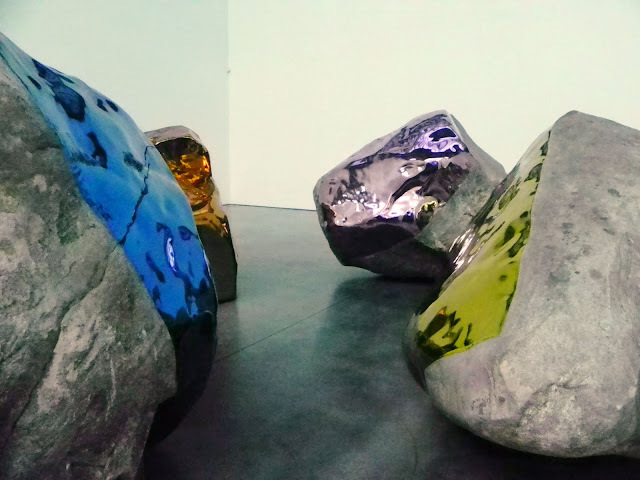 These giant rocks are enormous in scale, though the size might appear intimidating however its colorfulness emits more than light but warmth to the heart. 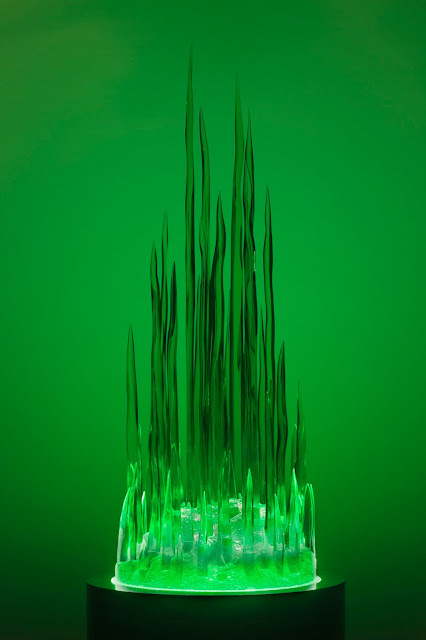 According to the press release, a recent trip to India has inspired Jim Hodges to produce the piece. While all the colors are warm in tone but on the other side the rocks reveal the coarse and cold surfaces of stones. 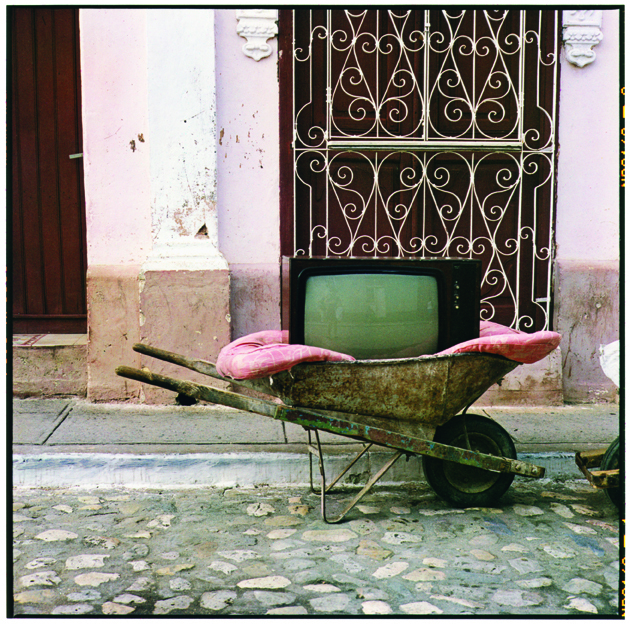 It is these two opposing materiality that reinforce the work's impact on the spectators both visually and viscerally. Perhaps I have used the word visceral a little too much in this posting, however what is art but an experience that its aim is to initiate an emotional response with its spectators. It is true that experience comes in different forms and it isn't always a gut-feeling that counts the most, there must also be a certain degree of intelligence of judgement as well as intellect. However, let's not deny our nature as human beings and when it comes to things such as love and other irrational emotions we can't help but give into our inner selves. Although I only am highlighting these two pieces in the posting, in fact, there are more works by Jim Hodges in the current exhibition. 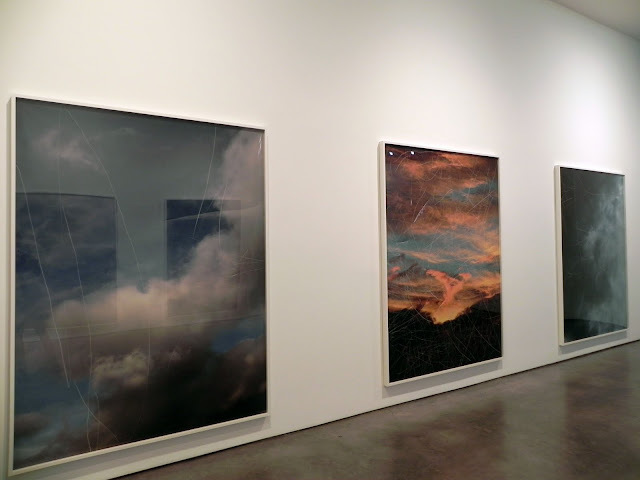 After all, the entire exhibition occupies two gallery spaces; there are color photographs of orange red sky and blue clouded sky with their surfaces and emulsions scratched multiple times. It seems as if a nostalgia for intangible beauty and emotion is presented along with its violent nature to destroy itself. Finally, let's not forget the black mirror piece in which there weaves a spider web-like pattern that seems to echo his previous works. "Beauty is the motivating energy that powers my life and the work I make. Beauty is ultimately what I wish my work to give—beauty of experience."